Protect and beautify your home with a maintenance-free color coordinated, rain carrying system. Our system is designed to work as a complete protection and beautification package for all new home construction, existing remodeling, and commercial properties. • Eliminating time-consuming and costly painting of those hard-to-reach places. • Controlling water run-off, preserving landscape and basement flooding. • Reducing expensive annual maintenance costs. 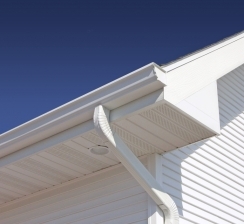 • Controlling moisture and rotting problems inherent in eaves and overhangs. • Adding beauty and longevity. • Increasing the value of your property. 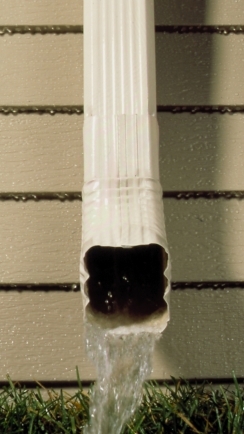 Reduces clogging and improves water flow by 33% over conventional downspouts.